No less than 23 cities and towns in the U.S. are named after the capital of France, but only one takes the title of “The Second Largest Paris in the World.” Indeed, Paris, Texas rivals its French counterpart in impressive architecture and delicious cuisine, all along with that friendly small-town hospitality that the Lone Star State is known for. This version of Paris even has its own 65-foot-tall Eiffel Tower illuminating bright beautiful colors at night, complete with a 10-gallon red cowboy hat! Beyond the obvious influences of its European cousin, Paris is a thriving town with an active arts scene, picturesque parks, and all sorts of fun annual events. No matter what brings you to Paris, you’re going to have a great time. Start your trip in Paris by taking a reverent stroll through the Red River Valley Veterans Memorial, located next to the Eiffel Tower. The memorial honors those from five counties who have served, or are currently serving, in our nation’s military protecting our freedom in the past, present, and future. If you’re looking for a space to host an event, look no further than the Love Civic Center. This multi-purpose facility is able to accommodate a variety of activities, meetings, parties, conventions, and events in its 13,200-square-foot Exhibit Hall that has a capacity of up to 1,400 and banquet facilities up to 1,080. The Center also has six individual rooms with moveable walls for breakout sessions, a full catering kitchen, two indoor concession areas, and super sound and lighting systems. Its parking lot accommodates up to 568 cars, 45 RVs in front and 12 in back, and includes 11 handicap spaces. The voices of yesterday and yesteryear still echo here, speaking to modern-day travelers of the trials and triumphs the people of this area have experienced since first settling here in the 1820’s. Named after Paris, France, by an employee of the town’s founder, George W. Wright, the town prospered as a farming and ranching community until the arrival of the railroad. Paris was named the seat of Lamar County before the Civil War, and it was one of only a handful of counties that voted against Texas secession. Experience Paris’ past by paying a visit to the Lamar County Historical Museum, an unassuming building packed with artifacts, photographs, and re-creations detailing life in town over the decades. In the attached Rural Life Museum, check out the blacksmith shop complete with authentic tools, as well as a pioneer kitchen, the historic Biard Cabin, and more. Hours are Friday and Saturday from 10 a.m. to 4 p.m. Walk across the parking lot to the Santa Fe Depot, built in 1914, to visit the Lamar County Genealogical Society Library. 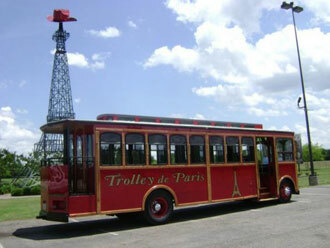 Also located in the Historical Depot is the Valley of the Caddo Museum and Cultural Center. This museum incorporates four counties and covers topics such as astronomy and beading, as well as railroad displays and an extensive collection of pottery and artifacts from local digs. The museum is open Friday and Saturday from 10 a.m. to 4 p.m.
For even more history, tour the Sam Bell Maxey House State Historic Site, a 19th-century Victorian-style home and get an up-close look at thousands of belongings and furnishings of the family that lived there for nearly a century. Hours of operation are Tuesday through Sunday, 9 a.m. to 4 p.m.
General Sam Bell Maxey and his family were laid to rest in Evergreen Cemetery, and his Mother, Lucy Pope Maxey, was the first burial in this Historical Cemetery in 1886. Examples of the stone-cutting art within the cemetery include a bevy of angelic figures, flowers, vines, cotton bales, broken trees, anchors and chains, sheep, and a life size buffalo. Yet one of the best known features of the cemetery is “Jesus in Cowboy Boots.” This popular monument marks the grave of Willet Babcock, and is visited by hundreds of visitors each year. If you’re looking for a one-of-a-kind outfit to take home, something tasty to snack on, or to admire some gorgeous architecture, head to Paris’ Historic Downtown District. Go treasure hunting – and score a great bargain in the process – at one of the many antique stores, boutiques, and retail shops. To pick up a beautiful painting or sculpture by a local artist, stop into the Plaza Art Gallery housed in the Lamar County Chamber of Commerce and Paris Visitor Center, and while there you can shop for Paris souvenirs. Shopping will no doubt work up your appetite, so make sure to savor a taste of the local flavor at one of the restaurants in downtown Paris. Make sure to stop by the Culbertson Fountain for photos of the elegant Italian-marbled edifice that helps makes Paris one of the prettiest downtowns in Texas. While there’s plenty to see and experience in Paris year-round, this North Texas town also boasts a variety of unique annual events that are well worth the trip. One of the most popular cycling events in Texas, the Tour de Paris Bicycle Rally, has more than 1,000 riders come to pedal along routes from 20 to 80 miles in length. The bicycle rally partners with the Paris Balloon Festival, an unforgettable annual event with hot air balloons, arts and crafts, and concerts all weekend. There’s also Winefest, the July 4th Parade and Fireworks, three annual square dance conventions, Paris Art Fair, Wings Over Paris Air Show, and the Archery Shooters Association Southwest Shootout that has more than 1,600 shooters and vendors participating. 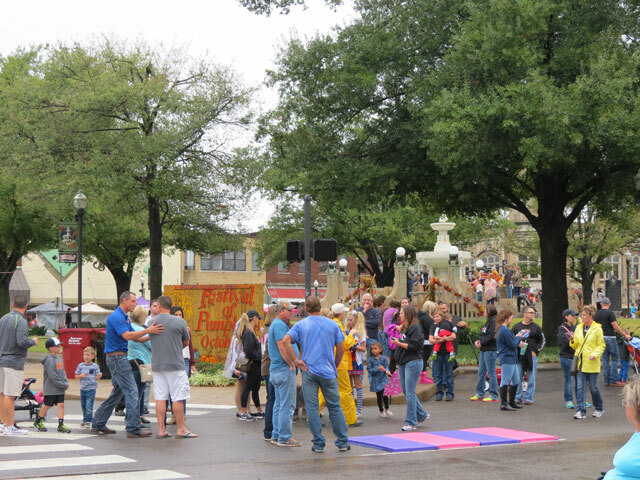 Later in the year, more than 100 boats race at the Southwest Drag Boat Races and the crowds gather for popular events such as Octoberfest, the Paris Antique Fair (held in the historic and beautiful Gibraltar Hotel), the Festival of Pumpkins, the Lighted Christmas Parade, and Christmas in Fair Park. Believe it or not, that’s not all that’s happening in Paris. Check out the city’s website for to see even more events. Keep dreaming of that trip to France, but in the meantime, make your plans to visit a unique Texas town with excellent shopping opportunities, great food, and tons of charm. Bon voyage!